I thought I would like this tool system. I have all the same complaints about my old tool belt as everyone else. Hurts the lower back, makes bending difficult, etc.... This suspender system seemed like a good idea, and it is. Just not for me. I tried it around the house for a few hours and noticed that when I reached over my head, the stiff shoulder pads pushed on the sides of my neck, though these may get softer with wear. And that my shoulder muscles had to lift the entire weight of the bags when reaching upwards. Also, these bags are BIG and WIDE! You will have to be careful if you are a remodel carpenter, walking through finished doorways and hallways. Still, this rig is very well made and if you need to carry lots of heavy tools and want to give your lower back and your waist a rest, this may work for you. It's a trade off. I purchased this belt set last January and I was impressed with how it relieved the stress on my lower back. I was also relieved of waist rot from conventional tool belts. The suspenders were easy to set up with the instructions included. Break in takes about a full week. 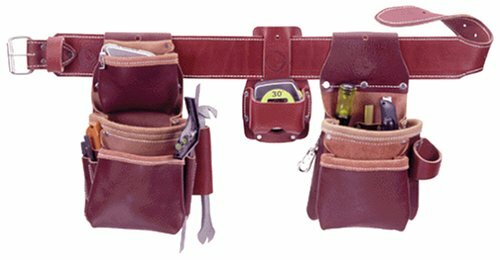 Pouches do hold lots of tools. As hotter weather came along, the suspenders hold a lot of sweat (later they began to smell). But I also noticed it was very uncomfortable when the suspenders wouldn't allow for your upper body to cool off. My shoulders also began to chaf. As for movement, the system doesn't cling to you. But working in very close quarters, (i.e. lifts, steel joists, some scaffolding,etc.) it was easy to get hung up and scrape against walls. I am considering selling my suspension belt, but pondering the fact that its not a bad set to own if you switch between this system and the belt a few times a year. That way I wouldn't wear out body parts to quickly. I owned the pro framer for years; then sold it to a helper for $... and he was happy. I bought the Pro Trimmer but was disapointed because the speed square holster (between the small and large bag) was not available on a rig of this size. After awhile I forked over the big bucks for the Stronghold System-the best there is. Oh I've read the reviews:adjustment-if you can't adjust this system you probably shouldn't be doing carpentry;the yoke; heavy duty, extreme quality products take time to break in-like good leather work boots or the Carhartts that last longer than anything else; the back strain relief; a no brainer-buy a weight belt and wear it along with the system-there is no belt to interfere; lastly, if you wear a framing belt in a finished house or around cabinets your going to mess something up-don't do it-I build cabinets and built-ins and do general carpentry for a living. The only criticism I have(the part about the missing star)is that this product should be available with the lightweight, green leather bags. After 1 year the nylon shows signs of extreme wear at the front corners. If Occidental Leather would do this for us I would be one of the first to buy them even for $... . I will wear this for as long as I work! The writing is on the wall; perfect this product and it will be a five star masterpiece second to none. I have the Stronghold system in leather, which [is no longer listed]... I think it is first rate in functionality and comfort, and wouldn't return to a belt. I think you have to analyze your needs and body type carefully: this system isn't always going to work better, for instance reaching up can be tiring, though that is true of suspender. If you have the kind of body that rides a belt, without suspenders, and it never shifts, binds, or restricts your breath, good for you, stay with the belt. It takes, however, only a few inches on the waist, whether from brownies or winter clothes for me to be hauling on a belt all day long. Another issue to look at is back pain. This system puts all the strain on your shoulders, were it flows down through your spine, and you don't have a big belt supporting the small of your back. That works out better with my back pain, but it may not for yours. I am 6'1", and I have no problem fitting this strap set. I like my knuckles to drag in the bottom of the deepest nail bag, which is a higher setting than many prefer. 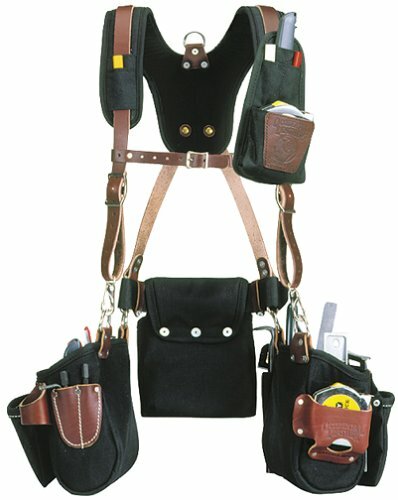 The bags by themselves are unique, and would fit nicely on a safety harness if the inspector prowls your worksite. 1. The bag is made of very durable materials and should stand up to many years of jobs site use. 2. There are plenty of pockets to hold small items such as tape, pencil, knife, screw drivers, etc. at very convenient reach. 3. Slips on and off in seconds. 4. Allows the user to bend at different angles with out being confined by a belt around the waist. 5. Pouches are less likely to spill contents when working at different bent over positions. 6. 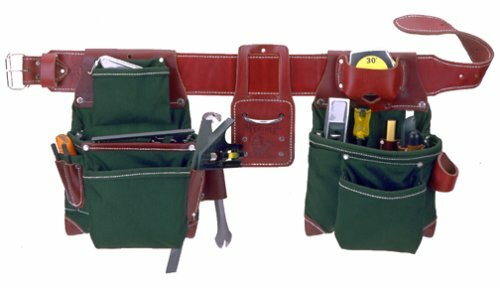 Two large pockets to hold larger sized tools. 1. The system is difficult to adjust for use the first time out of the box. (Set up is done only once so this is a minor pain only) 2. The shoulder pads, although very comfortable, will get dreanched with sweat if you work in the heat. (I need to think of something for the odor?) 3. The system does not remove weight from your lower back as I had thought it might. You can carry a ton of tools with this system, but you will feel it by the end of the day. I install siding, windows and do general carpentry. This bag gives me flexiblity and capacity that I didn't get with my old belt. I like the system and would recommend it to people that feel confined by belts or that are looking for a good capacity well organized system. I really get a lot of enjoyment wearing my Occ.5055, great weight distribution on the shoulders, and adds to the "professionalism". One problem wearing such a rig in sunny southern Calif. Is that it has a tendency to draw out excessive moisture from your body, the "yoke" covers a great deal of you back and after wearing it the first few consecutive days I developed a skin rash dead center of my back and on my front shoulders. Aside of this, I still wear it cause it's hard to find a alternative system with the same "qualities". As for the "rivets" stop by any hobby shop and pick up a few extras or do like I did, use large "aluminum" pop rivets to pin down your bags/holsters. I'll admit it--I'm a snake-hipped electrician. You've all seen it before: toolbelt working the pants down towards the knees, tidy whities riding high. It's not a pretty sight. I had tried the usual suspenders that can't take the load, always get in the way, and come unclipped at a strong glance. When I first heard about the Stronghold suspension system, I was definitely interested--if a little leery of the $70 price tag. That's almost what I had invested in my whole toolbelt. Well, I took the leap and boy howdy am I glad I did. The workmanship is first rate, the materials are hard-core solid, and the design is impeccable. I've had my Strongholds for almost three years of daily use now, and they are still going strong. The padded yoke distributes the bag's weight evenly across my shoulders, even when the bags are unevenly loaded. 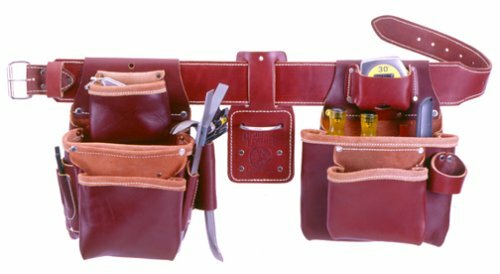 I can leave my belt unsnapped in the front for greater ease of movement or easy shedding, and my tools are still right at hand. There's a heavy duty hanging ring conveniently located on the padded yoke, so I can set a nail in a stud and hang the whole affair up off the ground at lunch time. Like another reviewer, I find the chest strap the perfect place to hang my cel phone. 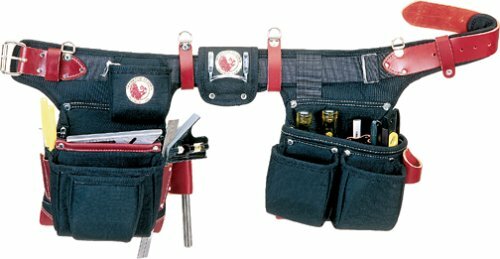 My toolbelt has velcro on the belt that keeps the individual bags in place, so I had no problems with the supplied four beltloops sliding, unlike other reviewers. I'm glad I used the beltloops, as it allows me to disassemble the entire belt for rearranging pockets or washing. My only nit to pick with this product is that Occidental Leather should provide extra rivets. I bunged one up when first setting up my suspenders, and it took careful work to salvage it. Having a spare set, as other reviewers have noted, would be handy. I found this system very comfortable except for one flaw. 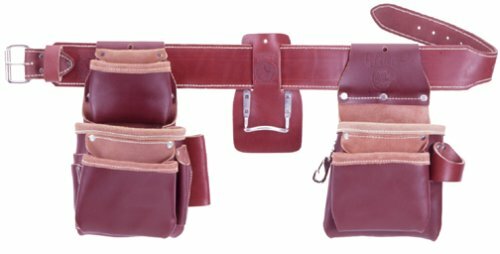 It comes with two ways of attaching to your belt: first by means of four leather loops that go around the belt the D rings are rivited to the loops and the suspenders clip on to the D rings, second with the D rings rivited directly to the belt. Myself I wasn't ready to commit to attaching the rings right to the belt in case the position wasn't quite right. The problem with the leather loops is that they slide toward the middle of the back of the belt when your bags are loaded. This causes the otherwise excellent padded yoke to work its way down you back as you bend and straighten throughout the day. This is extremly irritating. The system comes with only one set of rivits so unless you jury rig your own attachment, your stuck. I recommend using a jury rigged temporary attachment before commiting the rivits to a final position as another reviewer mentioned. When you do attach the D rings make sure the are far enough apart in back to keep the yoke from sliding down and you will have an excellent system. If Occidental had included two sets of rivits I would give the system four stars. The Stronghold Suspension System is, without qualification, the finest suspension system on the market today. Quality materials and workmanship clearly standout from the minute you unpack the product. The assembly instructions are clear, straight forward, easy to follow and accurate. Once you have the suspenders on your belt it will take a little adjusting to find the perfect fit. Generally, in a day or two ,you will have them dialed in and working as advertised. An additional set of D rings and copper rivets would be a nice touch if you want to mount directly to your belt and get away from the straps after the adjustment period. At 6'1" I have about 6" of additional adjustment available and I wear the belt a couple of inches below my waist. This is a quality product that performs extremely well. At first I thought the chest strap was a bit of overkill but it proved to be the perfect place to clip a cell phone. This is one of those rare products that actually works at a level beyond your expectations. 4. Occidental Leather 6100T-XXL Pro Trimmer Belt Package, Approx Pant Waist 45" to 49"
5. 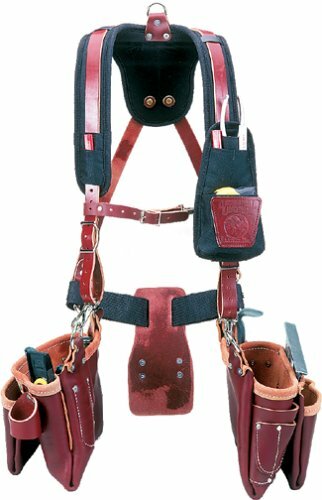 Occidental Leather 5080LH-XL Left Hand Pro Framer Belt Package, Approx Pant Waist 40" to 44"
6. Occidental Leather 5080LH-L Left Hand Pro Framer Belt Package, Approx Pant Waist 36" to 39"
11. Occidental Leather 1500-XXL Barrel Bag Set, Approx Pant Waist 45" to 49"
12. Occidental Leather 5080LH-XXL Left Hand Pro Framer Belt Package, Approx Pant Waist 45" to 49"
Before spending the money on Occidental you should take a look at www.skillers.com . They have a very innovative system of work wear which may be right for you. I was considering one of the occidental systems but the price was concerning me. A similar system is available from Skillers for less than half the price. Before you decide, just visit Skillers.com . I bought this belt about 1 year ago, and they are still going strong. They are very comfortable, and have tons of room. It is great for framers becuase there are so many pockets, no more getting your 8s mixed up with your 16s. Definitely worth the money. When these belts wear out, I will be quick to get another pair. Could Do Better.... From a Pro. Framing Carpenter. Because pouches are widely attached at each end....contents spill when crouching or bending. Contents of large nail pouch partially blocked by immovable tape pouch. More stitching needed on quick square slot...as mine quickly unraveled leading to second nail pouch droop. Would Not buy again. This belt is one of the most compfordable belts i have ever wraped around my waist. It is well worth the money!!!!! five stars with out a dought. A true future classic ! I am a carpenter, I use a lot of tools constantly, therefore I need to carry them. I was using occidental leather bags for couple of years they worked great except the weight was taking a toll on my back that is when I decided to get a beltless system. With in a few days of ordering I received my equipment (I actuaaly ordered it even reading some of the negative reviews) It took a little puting it all together but it was well worth it, they work great, confortable and my back feels better; if you get them make sure you spend sometime adjusting them to you, all it takes is some patience an creativity (to keep them from swinging, like an atatchment on the front bags) so good luck with your confortable and styling new bags. 19. Occidental Leather 8080-XXL Oxy Lights Pro-Framer, Approx Pant Waist 45" to 49"
I have had these for a couple of years but I don't use them because they don't stay on and are not comfortable. My old True Value leather ones have performed better. These just look fancy and I thought they would work better at the time. These are the best pair of knee pads I've used. They are very comfortable but do tend to slip off the knee occasionally. I do metal stud framing and am on the floor most of the day doing layout work.